What's on the menu at the bitter end of December on our homestead? Lots! On Christmas, I broke into the brussels sprouts in the quick hoops for the first time. 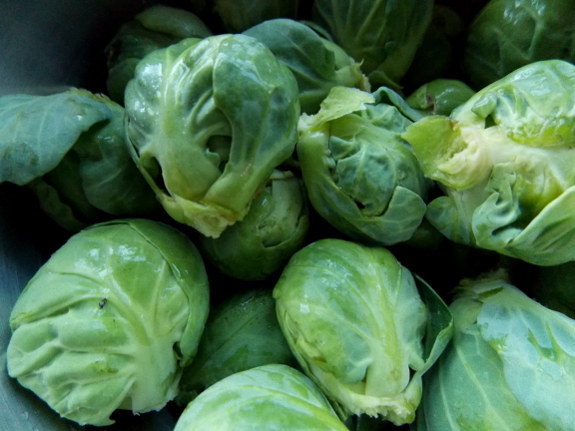 They were huge and plump, and 1.5 plants provided enough sprouts for a hefty side for two. I figure what's left should last us through the end of January if I serve them twice a week or so. The lettuce is just about gone under the quick hoops, but we've got plenty of leafy greens both inside and outside the quick hoops to enjoy --- mustard (a bit damaged by cold) and three kinds of kale. 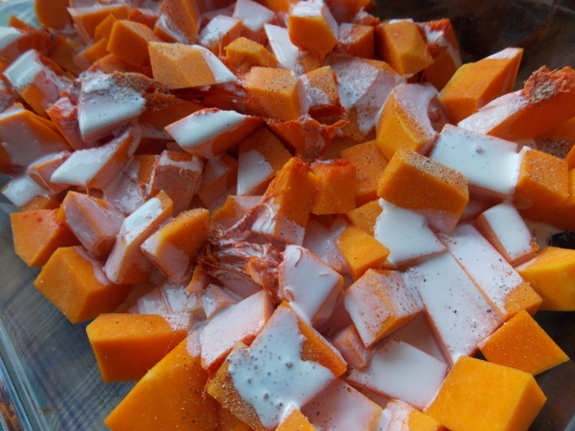 In the kitchen cupboards, we've still got masses of butternuts, sweet potatoes, garlic, and onions. The first three are no surprise, but this is the first year we've managed to grow enough onions that we didn't run out before the new year. Maybe they'll last all the way until next year's harvest? 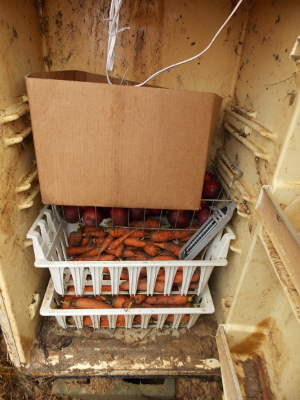 We ate up the last cabbage last week, but still have at least half a bushel of carrots in the fridge root cellar. Unless I'm forgetting something, that's it for fresh vegetables...but that's okay because there are also lots of green beans and plenty of vegetable soup in the freezer, plus various fruits, jams, and sauces, frozen, canned, and dried. Quite an abundant array of homegrown foods to last us until the spring 2014 garden gets underway! Anna, I'm curious- are there any staples you buy anymore? I seem to remember you saying you love avocados and can't grow them yet but do you purchase other treats or things like grains? Hi Anna- another curious inquiry: I know you've mentioned what type of onions you grow on your homestead, but would you please repeat it again, and how much did you plant this year to finally have enough to last you through the winter? Our homestead will be the same size of yours and it would be helpful to have an idea of the ideal amount to plant without having to go through eight years of trial and error! Maggie --- I answered your question on the blog this morning. Karen B. --- Your question seemed to merit a post as well, so stay tuned tomorrow or the next day! Thank you both for the excellent questions!